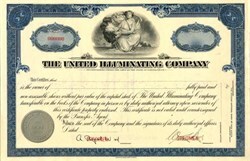 Beautifully engraved SCARCE Specimen certificate from the United Illuminating Company . 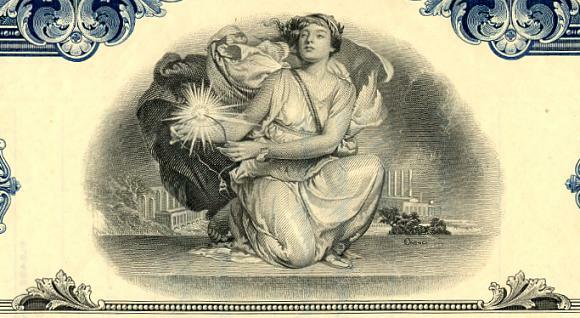 This historic document was printed by the American Banknote Company and has an ornate border around it with a vignette of an allegorical woman holding an electric light. This item has the printed signatures Company's President and Secretary. The United Illuminating Company, was formed in 1899 when the Bridgeport Electric Company merged with the New Haven Electric Company. UI is a regional distribution utility providing electricity and energy-related services to more than 318,000 customers in the Greater New Haven and Greater Bridgeport areas. UI doesn't generate electricity, but purchases, transmits, distributes and sells it to residential, commercial and industrial customers in a service area of about 335 square miles. This service area includes the principal cities of Bridgeport and New Haven and their surrounding municipalities: Ansonia, Derby, East Haven, Easton, Fairfield, Hamden, Milford, North Branford, North Haven, Orange, Shelton, Stratford, Trumbull, West Haven and Woodbridge. The population of this area is approximately 726,000 or 21% of Connecticut's population.